Your regular dentist may have referred you for a limited or comprehensive periodontal exam to evaluate the health of your gums. Our office also provides these exams if you do not have a regular dentist. To make registration more convenient, you can download our new patient information forms from our website, print them, and fill out these forms prior to your appointment. The forms can also be mailed to you if you prefer. Please arrive 10-15 mins prior to your scheduled appointment with your completed forms. Your medical and dental history will be thoroughly reviewed. Please allow 1 hour for a limited exam and 11/2 to 2 hours for a comprehensive exam. 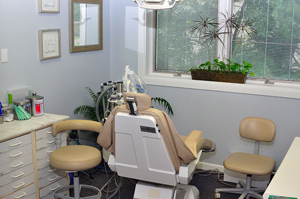 Digital x-rays (full-mouth series or individual) may be taken and a detailed evaluation by Dr. Brown is performed with patient comfort as top priority. Treatment is usually not provided at this appointment unless you are in discomfort or have severe infection. A treatment plan review appointment is scheduled 1-2 weeks after this exam. This allows Dr. Brown’s office to properly review with you the findings from the exam, Dr. Brown’s proposed treatment plan, and insurance/finance information. Our office hours are Tuesday-Friday from 8:00 am until 5:00 pm with lunch from 1:00 to 2:00 pm. Our office administrator is also available on Mondays to help you or our referring dentists. Hygiene appointments are available Tuesday-Thursday. Each individual appointment requires specialized time and preparation to offer you the best care available. This time is reserved especially for you and we make every effort to see you at your reserved time. Therefore, it is very important that you arrive on time and keep all of your appointments. In the event that you need to reschedule an appointment with our office, a 48 hours’ notice is required. This is to allow our staff to accommodate other patients. Our office will contact you 2 business days prior to your appointment for confirmation. If we have to leave a message, then we need you to call our office to verbally confirm your appointment. Payment in full is expected at the time of treatment for patients who do not have dental insurance coverage. If you do have dental insurance, we will file your insurance as a courtesy, but we do require that you pay your co-pay at the time of treatment. We will do our best to give you as accurate an estimate on treatment as we can, but please realize that our estimate is based on the information an insurance representative gives us over the telephone. We will be glad to submit a pre-authorization with your insurance carrier; just put in that request with our administrative staff. We do ask that you keep in mind that a pre-authorization can take 30 days to receive back from the insurance company, and it too, is not a guarantee of payment. Any amount unpaid by your insurance is your responsibility. For your convenience we accept cash, checks, Visa, MasterCard, and Discover. Payment can be divided into 2 monthly installments if necessary. We also offer a 6-month no interest or an extended 24-month payment plan with CareCredit if you qualify. The 24-month payment plan is set up on low monthly payments but it does accrue interest. You may apply online by visiting www.carecredit.com or call 1(800)365-8295. Please note this office is not affiliated in any way with CareCredit. We provide you with information about this company only as a courtesy to you.